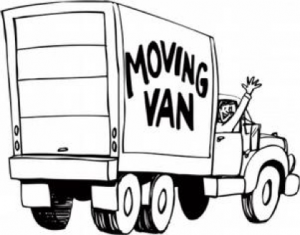 Home » Relationships » Is This Your Year of the Move? 2016 was the year of the move for our family and extended family. After 23 years and 5 kids off to live their adult lives we made the move from our 5 bedroom, two story, to a walk-out ranch with just enough space for us as empty nesters and accommodations for larger family gatherings when needed. In addition to our mov, my parents moved to a retirement village, my husband’s brother and his wife moved to a new location, our oldest son, wife and grandkids moved to house more suited for their growing family; our second son moved from an apartment to a house he shares with roommates; our daughter bought her first home, and our youngest, who is still in college moved at the beginning of his term last Fall. We became experts at purging, packing and and planning our new spaces. We had fun decorating, buying some new furnishings and other items. Of course, there were frustrations to deal with; especially when it came to repairs and fix ups on the old place, working with mortgage brokers and finding a reliable moving company and dealing with the weather on moving days. But as we’ve all been settled in for a few months now we are all reaping the rewards for the hard work and stress that went into the moves. Moving was a bonding experience for our family also as most of us were able to pitch in to help on the various moves. Moving doesn’t always mean an actual physical move, however. Is there a move you need to make in your life? Is there some purging, packing and planning that needs to happen in other areas of your life? A new year can be a good time to purge some unhealthy habits, relationships or anything that might be toxic in your life. It’s a great time to pack up real junk in your life whether literal or figuratively. If you haven’t used it or it hasn’t been a positive in your life then it might be time to back it up and ship it out. It’s a time to plan new strategies, make new goals, think outside the box, or set a new path. Yes, there will be some frustrating and painful moments to endure whenever change is made, but the reward is sweet when you know you’ve accomplished your goals.